Stage Lighting: Design Applications and More builds upon the information introduced in Stage Lighting: The Fundamentals to provide an in-depth reference to a number of specialty areas of lighting design, from traditional applications such as drama, dance, and designing for different venues, to more advanced applications such as concert, corporate, film and video, virtual, architectural/landscape, and other forms of entertainment lighting. Each chapter gives the essential background, design practices, and equipment details for each specialization, so readers can make informed decisions and ask informed questions when encountering each field. The book provides insight on the latest technology and includes profiles of prolific designers, such as James Moody, Jeff Ravitz, Alan Adelman, and Paul Gregory. 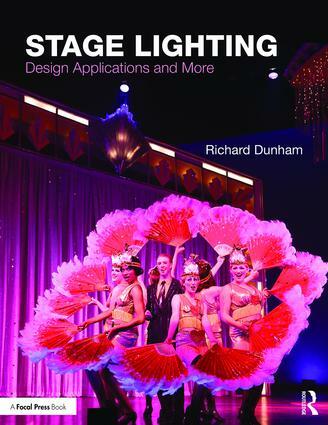 Stage Lighting: Design Applications and More is intended to help lighting designers translate their theatrical skills to other areas of lighting design, and provides guidance on how to take those initial steps into new ventures in their lighting careers. Richard Dunham is a Scenic and Lighting Designer as well as a Professor and Head of Design at the University of Georgia. He is a USITT Fellow and former Lighting Commissioner from 1998 to 2006. His professional credits include numerous productions throughout the East Coast, NYC, and Midwest, as well as being LC certified and a member of IALD and IESNA. He is the author of Stage Lighting: The Fundamentals (Routledge, 2019).